So while browsing the web today I came across something I found to be a little bizarre. Ya I am on the Tim Tebow bandwagon. The guys a winner and has completely turned around the Broncos season. I came across a Tebow fan that loves the guy so much he got a tattoo to prove it. I’m all for getting a tattoo of your favorite team or something along those lines, but a tattoo of a player that’s proven himself for 7 games? Come on’ guy. Not only is this borderline ridiculous, but the tattoo just looks terrible.If you look at the tattoo closely you can see there is just a helmet sitting on top of the guys chest. The guy doesn’t even have a head. Hopefully the name of the artist that did this tattoo doesn’t get released for the sake of his career. This entry was posted in Everything Else and tagged broncos, nfl, tattoo, tim tebow by davecouture. Bookmark the permalink. The artist is my cousin and no one knows the real story behind it so stop making up a bunch of BS. 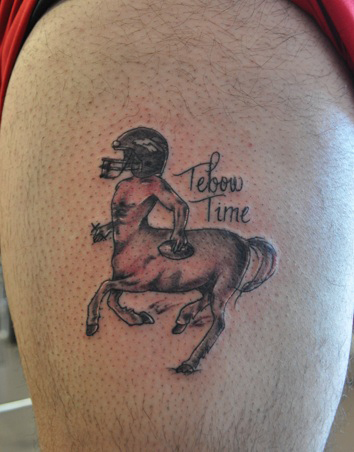 There was a bet involved and the bet was Tebow had to win 5 games and if he did then this tattoo would be done. Obviously, my cousin won the bet. He’s a great artist so don’t judge his work off of a small tattoo. He also did this drawing https://twitter.com/#!/NanaTheLyricist/media/slideshow?url=http%3A%2F%2Ftwitpic.com%2F7qcbeu so leave your negative comments to yourselves.